Two dogs are starting the next chapters of their lives after being taken from shelters and trained through the New Leash on Life program. The women who trained them are also getting back on their feet thanks to the program. Friday night, the program celebrated the newest graduates, Granger and Pike, a pair of dogs staying for the moment at Charlie’s Angels Animal Rescue in Fletcher, but who program organizers hope will soon find a forever home. The program is a collaboration of the Swannanoa Correctional Center for Women and Charlie’s Angels, hoping to find permanent homes for dogs that were likely headed for euthanasia by finding women inside the correctional center to train them into adoptable pets, at the same time giving women experience with a skill. Kim Smith, with Charlie’s Angels Animal Rescue, said her organization got involved with the program about six months ago. She hopes to begin an eight-week cycle of graduating two dogs from the program and then starting two new dogs. It’s a chance to save dogs that are essentially on death row, she said, and provide women inside the facility with a skill set they can use once they get out to help them find a job and get back on their feet. Dogs chosen can range from 9-month-old puppies to fully grown 5-year-old dogs, she said, but dogs are chosen that likely don’t have a chance at making it out of a facility otherwise. Once it gets close to time for the current set of dogs to graduate, Smith said they go to the county shelter and find two unruly dogs, who may be a bit aggressive or lacking in manners training, and pick them for the program. The first two dogs that went through the program with Charlie’s Angels are now living with their forever homes, she added. Friday night, Granger and Pike graduated, and two new dogs, Beans and Boomer, headed off to start their classes. 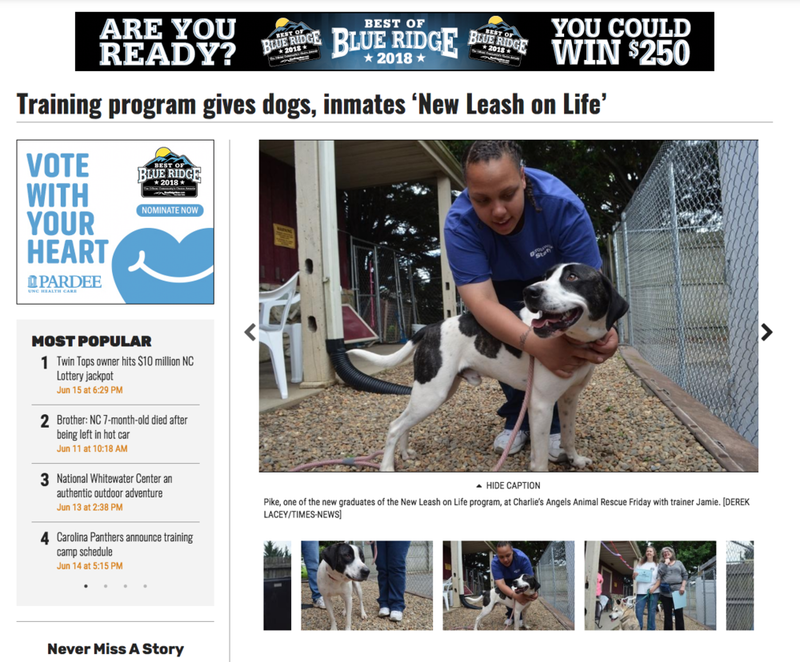 Mark Patneaude, with the Swannanoa Correctional Facility for Women, said the women really enjoy and love working with the dogs, taking them everywhere except back to their rooms for the night or in the dining hall and chapel. More than 100 women apply for the program but only four are chosen, and officials try to pull from those who have also participated in the facility’s pet tech program. Those four women work with a volunteer trainer, Lezlie Stein from Handle With Care Dog Trainer, and a Charlie’s Angels volunteer. The four women – two main trainers and two assistant trainers – love the program, Smith said, falling in love with the dogs. They follow up to make sure they’ve made it to their forever homes. At the end of the 12-week program, the dogs receive their Canine Good Citizen certificate, another valuable experience to put toward an animal care career for the trainers. That certificate is an official American Kennel Club program and one that the dogs must pass a test in order to earn, Stein explained. The hope, Patneaude said, is that the dogs will be adopted before they graduate. The Department of Corrections operates dog training programs inside multiple facilities. Lezle Stein, formally of Los Angeles, California, has recently moved into western North Carolina, bringing with her a myriad of talents, expertise, and devotion to the animals of Rutherford County. Volunteering for PAWS of RC, Lezle is training adoptable dogs as they await their 'fur-ever' families. PAWS of RC, Lezle tells us, "is a foster-based, 501(c)3 organization dedicated to bringing 'No Kill' shelters to Rutherford County. Our mission is to end the killing of adoptable dogs and cats in Rutherford County, by combining: trap, neuter, release programs for free-living (feral) cats, low-cost spay and neuter outreach, work with rescue groups, foster care programs, comprehensive adoption programs, pet retention efforts, medical and behavioral rehabilitation, volunteer and education programs, with the support of the community, in order to provide a no-kill animal shelter for homeless, adoptable dogs and cats in Rutherford County." Lezle continues, "Since it's inception in 2013, PAWS of RC has provided free or low cost spay/neuter services for over 2500 pets, distributed over 30,000 lbs. of quality dog and cat food, provided over 40 dog houses to pets in need, and re-homed/rescued over 400 owner surrendered pets." Prior to moving to Western North Carolina, Lezle was a highly regarded dog trainer in the Los Angeles area. She was featured in the Blu-Ray DVD release of Marley & Me, in which she offers dog-training advice throughout the movie. Those familiar with movie know it's about an adorable yellow Labrador who doesn't always behave the best. 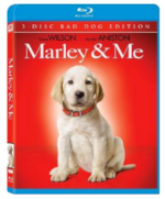 "In Marley & Me, the rambunctious Lab is fortunate enough to live with people who don't abandon their dog despite the fact that he is completely out of control," says Lezle. "However, this lack of training--really a lack of communication--doesn't work for most pets or pet owners. I hope with my continued work with dog lovers, we can continue to create fulfilling relationships that nurture pet owners as much as the pets." Lezle is a member of The Association of Professional Dog Trainers and is American Kennel Club (AKC) certified as a Canine Good Citizen Evaluator. She has served as a volunteer adoption counselor at North Central Los Angeles Animal Shelter, assistant pit bull trainer through Tia Torres' program at the Villalobos Rescue Center and Best Friends®, co-president of Hermon Dog Park (Los Angeles), a member of the Los Angeles City Council Spay and Neuter Advisory Committee, and Director of Animal Welfare for the Arroyo Seco Neighborhood Council. Her extensive education and training also includes American Red Cross certification in Pet First Aid and CPR, the Paul Owens' Raise With Praise® program, and CERT (Community Emergency Response Team) training. Lezle also worked with many rescue groups in the Los Angeles area, including Downtown Dog Rescue, Dawg Squad, The Brittany Foundation, and Best Friends. In North Carolina, Lezle also volunteers for Charlie's Angels Animal Rescue in Hendersonville by training other volunteers how to be better handlers. Recently, she started a Lake Lure chapter for the Rutherford Humane Society, where they will hold monthly adoption events by the lake. Lezle offers weekly group obedience classes and in-home private instruction at Rutherford Pet Supply in Spindale as well as at Pine Gables in Lake Lure. For more information, contact Lezle by email at thedogtrainer@hotmail.com or by calling 323-229-4143. Her website, www.handlewoofcare.com features a calendar of upcoming events. Handle With Care in Blue Ridge Now! Training is open for business and starting dog training classes at Pine Gables in Lake Lure and at Rutherford Pet Supply in Spindale. Owner Lezle Stein also offers private in-home sessions. assistance, puppy kindergarten and orientation counseling for new dog owners. Handle With Care Dog Training serves Lake Lure as well as the surrounding area, including Henderson County. For more information about the classes at Pine Gables, contact Stein at 323-229-4143 or thedogtrainer@hotmail.com. For more information about the classes at Rutherford Pet Supply, 115 Reservation Drive, Spindale, contact Stein or Rutherford Pet Supply at 828-395-2323. Drive around any major city, and sooner or later you will find yourself downtown, often a deserted-looking area filled with manufacturing plants and factories punctuated by empty lots and the people who gather in them. And then there are the dogs: everywhere you look you can see dogs, some in packs, some wandering alone, and some with guardians who have no homes. Most of us avoid spending too much time in these seemingly-deserted areas – drab and neglected, they give rise to concerns about personal safety – and most of us feel only pity for the people, and animals, who spend their lives there. Los Angeles is no exception. The downtown area is famous for its seeming inhospitableness, and for its burgeoning homeless population. But to many people, downtown is where they call home, and, despite the bleak circumstances, where they intend to stay. That’s where Downtown Dog Rescue steps in. Downtown Dog Rescue is a unique program that is making a difference for the many sick, neglected and abandoned dogs who have ended up living on the streets of Los Angeles. The five-year-old volunteer program finds homes for strays roaming the streets and alleys, supplies veterinary services to pets kept by the city’s two-legged homeless population, and provides space and facilities for a monthly mobile spay and neuter unit sponsored by the City of Los Angeles. The aim is to make downtown a better place, and its impact is heartwarming. When Lori Weise and Richard Tuttelmondo – both dog lovers – began managing the Modernica Furniture factory in downtown Los Angeles five years ago, they were overwhelmed and depressed by the mushrooming population of neglected dogs. They wanted to do something about the sad problems; and without any prior experience or training in animal rescue, or in dealing with L.A.’s homeless population, the two began approaching homeless dog guardians to try to make a difference. They soon made an amazing discovery, which has benefited and enhanced many lives. “Most dogs belonging to homeless guardians are not abused or neglected; in fact, many of them have been rescued from abandonment by their present guardians,” says Weise. “We need to keep an open mind and not judge the dogs we see on the streets. We need to get rid of preconceived notions about where dogs should live and recognize that not all dogs work well in homes. Many of the dogs we are in contact with, despite not living in a home, are with people twentyfour hours a day and are very happy and well-socialized,” she explains. Weise and Tuttelmondo have worked hard to create reputations among the downtown population as people who can be trusted to help them with their dogs. Weise is fearless. She will walk into homeless encampments of over 100 people backed up by nothing more than plastic bags of dog food and flyers announcing their spay/neuter program. And her determination is paying off. Over five years, Downtown Dog Rescue has been responsible for spaying or neutering hundreds of dogs, and has found adoptive homes for nearly 250 pets. Downtown Dog Rescue’s adoption program is different from many others in that it attempts to keep prior guardians and adoptive families in touch with each other. Weise lets pet guardians understand that they are “calling the shots,” and that the difficult decision to have their dog adopted by another family is ultimately theirs. Homeless pet guardians become as attached to their charges as any other animal guardian; and, even as they recognize that they may not be able to supply all of the care their pets need, separation can be heartbreaking. Benny Joseph, locally known as “the downtown dog man,” has lived in a private semi-permanent encampment in the downtown area for over 20 years, and is one of the area’s most active animal advocates. Working with Downtown Dog Rescue, Joseph has fostered dozens of dogs in need of temporary shelter, and rescued dozens more. Lizzie was a typical junkyard dog, working in the yard of a local produce packing plant. Lizzie kept running away to be with Joseph until he and Downtown Dog Rescue were finally able to convince the packing plant’s owners to let him keep her. Downtown Dog Rescue provided medical treatment for Lizzie, who was severely malnourished, and made arrangements to have her spayed. Terry is another dog rescued by Joseph, after her original homeless guardian had tied her up and abandoned her in a box underneath a freeway overpass. Downtown Dog Rescue found her and brought her to Joseph for fostering and rehabilitation. Sadly, she initially kept running away from Joseph’s site, going back to the spot of her abandonment in order to wait for her original guardian. It was weeks before Terry finally gave up her search and settled down. Today, Terry and Lizzie happily live together with the downtown dog man. Downtown Dog Rescue is a not-for-profit organization operating solely on adoption fees and donations and grants solicited on their behalf by an affiliate program, Friends for Animals. Later this year, as a fundraiser, Downtown Dog Rescue will offer a calendar for sale featuring pictures of many of downtown’s dogs and their guardians. Weise is careful to point out that while Downtown Dog Rescue does offer referrals and other assistance to homeless pet guardians, all funds donated to the program are spent directly on animal care. Science Diet also donates dog food to the program on a regular basis, but much of the funding for their animal rescue operations comes directly from the pockets of Tuttelmondo and Weise themselves. The owners of Modernica, the furniture factory managed by the dog rescuers, provide space in their plant for the operation, including an area for dogs up for adoption, and allows the pair to use company trucks for transport. Professional dog trainer Leslie Stein donates her time to Downtown Dog Rescue to rehabilitate rescued dogs and offers group classes at halfoff to adoptive families and their new charges. Dr. Edward Simon from L.A. Central Animal Hospital also donates his time and clinic facilities to the program. Day or night, he will treat any dog brought in by Weise and Tuttelmondo, in any condition, and without an appointment. For those who want to help, the program is always looking for blankets, canned food, dog toys, used collars and leashes. Anyone who would like to donate goods, or is interested in purchasing the calendar featuring dogs and their guardians who have been helped by Downtown Dog Rescue, should call Lori Weise at (213) 683-1963, or write to Friends for Animals, Attn: Downtown Dog Rescue, P.O. Box 5280, North Hollywood, CA 91616, before sending or dropping off goods. More information about this inspirational program and its needs is available on the Internet at www.downtowndogrescue.com or www.friendsforanimals.org. We congratulate Lori and Richard for this innovative program that benefits so many two and four-leggers. Jennifer Wolfe is the new Associate Editor of Animal Guardian. She has worked in the not-for-profit community for over five years and currently lives with her husband and three cats, Annabelle, Sally and Hollis, in Los Angeles, CA. As a dog owner, I understand the bond that exists between humans and their pets. My chocolate Labrador, Coco, is an important part of the family. She brings my wife and me and particularly our kids, a lot of joy. Congrats to Wendi Riser, Lezle Stein, Ursula Brown and the rest of The Friends of Hermon Dog Park for all the work they do on behalf of our four-legged pals, not only for this event, but year-round. I look forward to it again next year! Dog trainer teaches people how to show their dogs—with a great deal of love—exactly who's boss. roost and she and her partner, Lucienne Ryerson, had to sit on the floor while Nikki and the couple's other dog sprawled across the couch. "It seems ridiculous," Mahoney says, "but it got to a point where it was less trouble just to let them have the couch than it was to deal with the growling." Tim Duffy wasn't afraid of his dog Elliott, he says, but neither did he have any control over the animal. "I used to have to sit in the back yard and just wait for him to calm down before I could even go into my house," Duffy says. "He was just insane, bouncing all over the place." Elliott did more than bounce. Shortly after Duffy brought the animal home from the shelter, Elliott began "barking, jumping, chewing, biting—just everything you could think of," Duffy says. "Frankly, I didn't know what to do. I thought I probably had made a terrible mistake adopting this dog." Michael Bell was similarly frustrated. "Sadie, who is a chow mix, had quite a behavioral problem at the time we rescued her from the pound," he recalls. Although she seemed calm and serene when Bell brought her home, shortly after moving in, she began "ripping furniture, peeing in the house and chewing everything." Although he and his partner had both had dogs as children, neither of them had ever been responsible for training the animals, and neither felt they knew what to do to curb Sadie's destructive behavior, or turn her into an animal they could happily live with. For Mahoney, though, her dog's behavior was starting to look ominous. And when Nikki, a shepherd-akita mix that Mahoney and Ryerson rescued, grabbed a neighbor by his pantleg and refused to let him go, Mahoney decided she needed to do something about the animal. "He was aggressive. He was scary," she says. When Nikki dug his way under a fence that Mahoney had constructed to keep him in, she says she took it as a sign that something had to be done. Enter Lezle Stein, who, to hear her admirers tell it, ought to be calling herself "the dog whisperer" instead of a dog trainer. "I called Lezle and told her what was going on," Mahoney says. "She was appalled at how we were having to live." Stein, who offers dog training classes in parks in Silver Lake, Mount Washington, Griffith Park and, starting on Monday, in Elysian Park, has helped local dog lovers not only keep the animals they take in, but learn to like them, too. Stein says it isn't so much the dogs she has to train, it's the people. "What I teach people is how to shape the behavior of their animals," she says. "I teach them how to be the boss, how to control the animal and get the dog to want to do what you want him to do." And a lot of teaching the humans, she says, is educating them about the kinds of animals they have adopted. Different breeds, she says, will have different strengths—and different weaknesses, from a human perspective. "One of the first things I ask in my classes is, 'How much do you know about your dog's breed?'" she says. "What is that breed bred to do?" That alone will shed a lot of light on what an owner might consider to be a behavioral problem, she says. "If you have a terrier, it's going to dig. That's what terriers do—they dig," Stein says. Since this is instinctual behavior, Stein instructs her human students to work with the animal, rather than against it. "It's simple," she says. "Give a terrier some place where it can dig." According to her clients, Stein's sensitive, common-sense approach to dog training is capable of producing near-miracles. Duffy says he was considering finding another home for Elliott when he saw Stein's phone number on a flier near his home in Silver Lake. "I called her and she came in to do some in-house tutoring," he says. Within a week, "the difference was astounding," Duffy says. "Elliott was much calmer. He was sitting. He had stopped jumping when I came in the house," he says. And it was enough to give Duffy the confidence that he could train, and therefore keep, his dog. But Duffy believes he may have had more to learn from Stein than Elliott did. "Lezle needed to teach me how to treat the dog, how to understand its behavior and how to keep control of the animal, so that it wouldn't control my behavior," he says. Mahoney says she too required some education. Until Stein came to the house and pointed it out, she and Ryerson hadn't realized that their behavior was contributing to Nikki's aggression. "I think we were very indulgent, amd we didn't know what to expect from her," she says. "Also, we realized that we were getting really nervous when someone would come into the house, which was making Nikki nervous as well." One of the first things Stein recommended was that Mahoney and Ryerson learn to calm down themselves. "She had us take deep breaths," Mahoney says. Stein says getting people to understand and take care of their animals has been a passion for a number of years, and she's particularly committed to making sure that people who rescue animals are able to work out a relationship that suits everyone in the household. And there are precious few dogs—or people, she believes—that aren't trainable. Mostly, she says, it's about manners and confidence—where a dog and a person understand each other and respect each other. And when it works well, it's a beautiful thing. "It's a great thing to watch the socialization of the dogs," she says. "It's really neat to see as dogs get manners, the dog also calms down, gets more confident that someone is the leader. That makes everybody happy." Stein offers dog training classes all over the city. For more information or to enroll, call (323) 225-6700. Handle With Care was featured in Los Angeles Times Magazine on Sunday, March 3, 2002. Click here to see it life-size (200k). Lezle’s work with Downtown Dog Rescue was featured in the Los Angeles Times on December 31, 2002.